Grant Park is located in Northeast Portland. It is bordered by the Sullivan's Gulch, Irvington, Alameda, Beaumont-Wilshire, Rose City Park and Hollywood neighborhoods. Grant Park is conveniently located along Tri Met bus lines, and relatively close-in to Downtown Portland. The Grant Park community has a family-friendly feel, with quiet, residential streets lined with comfortable family homes. 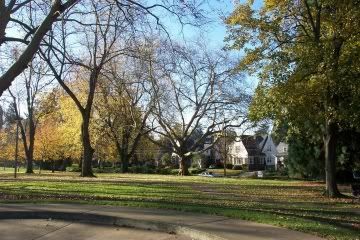 The gem of the neighborhood is Grant Park, with large mature trees, and a nice playground, as well as a dog park area. Grant Park adjoins Grant High School, and has lit tennis courts, a pool, a track, and lots of playground equipment for kids. Grant Park is conveniently located near coffee shops, restaurants, and shopping in popular commercial areas lining Broadway, and along Fremont St. in the Beaumont-Wilshire, Irvington and Alameda neighborhoods. Also nearby in the Hollywood district, you will find additional shops, restaurants, and the popular neighborhood Trader Joe's market. Besides visiting the park, neighbors also enjoy walking through the hills behind 35th and Siskiyou for beautiful views, and exploring the hillside stairwells that take you to the top of the stunning Alameda Ridge. Definitely drive under the trees on Knott Street between 33rd and 42nd Avenues in spring time to enjoy the show of cherry blossoms, and in the fall to enjoy the maple leaves! Also, this is an excellent neighborhood for summertime yard sales. Grant Park offers a wide range of home styles, from classic Old Portland style homes to Craftsman Cottages, Cape Codes, Bungalows, Colonials and more. Along the tree-lined residential streets, you'll find that homes are well cared for, and yards are nicely landscaped and well maintained. 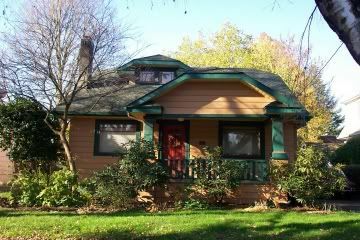 If you are interested in buying or selling a home in Portland's Grant Park neighborhood, visit our Portland Real Estate Page for more information, or visit our Portland Real Estate Map to search the RMLS for Grant Park homes for sale. Enjoy Gustav's for German American fare, where locals enjoy sitting at the bar and eating house-made pretzels and fondue...and of course, drinking from their enormous beer selection. After shopping at Trader Joes, stop in to recharge with some sushi. Hama Sushi has friendly service, clean and cozy interior, and good prices. Northeast Portlander's know.. for some excellent Thai food, you'll want to try Tuk-Tuk Thai on Fremont St., or Sweet Basil Thai on Broadway. If you have more information about Grant Park and would like to contribute, or if you have photos to share, please contact us. Thanks to our contributing author to the Grant Park page, local resident Lee Ann Moldovanyi.